The fillet tool creates a rounding between the selected lines, with the radius chosen by the user. The new arc is built using three circles. The first circle has the center in the intersection between the two lines (green). This circle’s intersections with the two lines are used as the centers for two other circles (magenta). 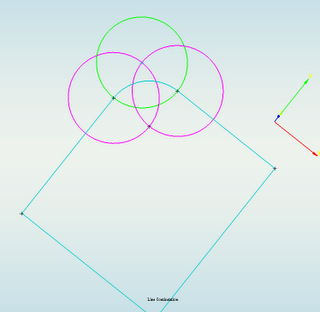 These circles intersect in two points: the original line intersection and the point that will be used as the final arc’s centre.